As I am a VERY important cat, I thought I should have a State of the Union address. However, since this place isn’t really a union, it’s more of a dictatorship with me in charge, I’m going to call it the State of the Veterinary Hospital Address. Everything here is going very well. I think I FINALLY have the staff trained to give me food at the correct intervals and turn on the water faucets when I want them too. I have some great new toys and the visitors all worship me correctly. I am getting more and more visitors every day, and most of them bring their pets with them. 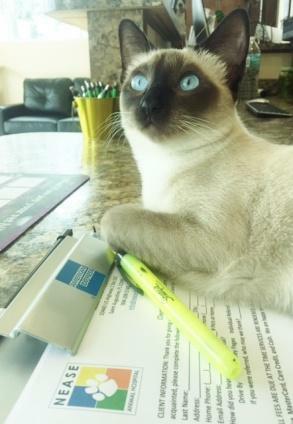 The rest of the staff claim that the pets are coming in for care from Dr. Esra, but I know that they are all coming in to admire me. We have been teaching puppy classes here at the hospital in order to teach dogs how to behave properly. I enjoy watching the classes, and have thought about doing the training, but decided it was too much work. I’ll let other people do that for me. Fleas, Ticks, and Heartworms. Oh My! Yup, it’s that time of the year again! It’s flea season, and from everything we’ve seen, it’s going to be a tough one! We did not have a very cold winter, which means we are going to have a pretty heavy bug year here! Fleas, ticks, and mosquitoes are the main external parasites that make our pets itch here in Florida. In addition to making everyone itchy, they also carry many dangerous diseases that our pets can catch, making it very important that your pets stay on preventatives all year long! Fleas are probably what we hear the most about. And why not, they make our pets miserable with their biting. If your pet has an allergy, that makes it even worse. Your pet could develop an infection and end up at the vet on lots of medications. Even in your pet is strictly indoors, they should be on a flea treatment! You can carry fleas inside the house on your feet, and it only takes one female flea to completely infest your home. In addition to the itchies, fleas can pass on diseases to your pet such as hemobartonella, a disease that causes severe anemia in cats. 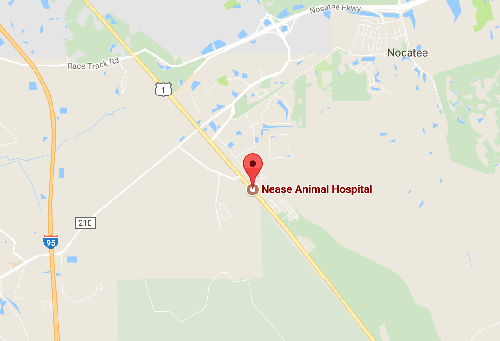 Ticks are very prominent in this part of Northeast Florida. Your pet can get ticks from underbrush, tall grass, and any wooded areas. Ticks are particularly known for spreading diseases such as Lyme Disease, Ehrlichia, tick paralysis, and many other potentially life threatening diseases. They are sneaky, some are very tiny, and it’s better to prevent them from attaching to your pet than it is to deal with the consequences afterwards. Mosquitoes, of course, are everywhere. If there is ANY standing water anywhere, you are going to get mosquitoes. These little pests are most well known for transmitting Heartworms to our pets. Heartworms lodge in your pets heart and can cause life threatening heart failure for your pet. Thankfully, we now have many effective and safe preventatives for fleas, ticks, and heartworms. Your pets all should be on these all year long in Florida, even if they are mostly inside! Mosquitoes can easily come in your house, and it only takes one mosquito bite to cause a heartworm infection! If your pet isn’t on a good preventative, contact us today and we can help get your pet protected! Just in time for Heartworm Season! Come in for a Wellness Exam and get your Heartworm Test for $5! Just mention this newsletter. Places to Go, Fun to have! 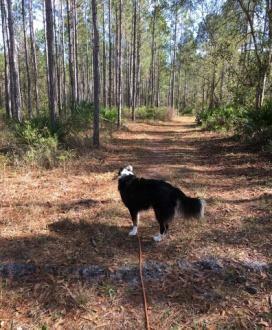 Here at Nease Animal Hospital, we enjoy long nature walks with our dogs. We wanted to share some of our favorite places with you! After all, what’s nicer than a lovely walk in a beautiful place with your family, both two footed AND four footed. 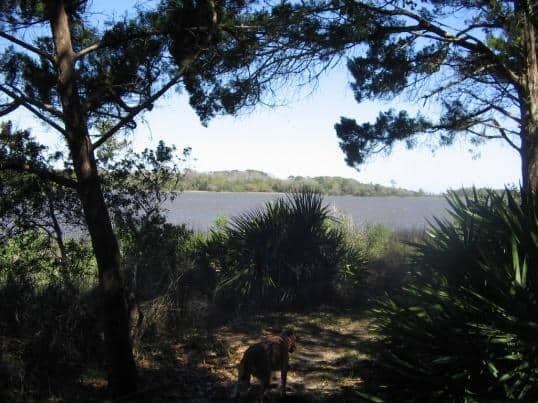 Dr. Esra enjoys taking her dogs over to Gourd Island Conservation Area off CR 210. There are nice wide, shady trails and beautiful woods. Juli’s favorite park is Princess Place. You can get lost for days on their lovely trails, lots of wildlife to see, eagle nests, and gorgeous trails along the Matanzas River. Sarah, Quansuella, and Taylor are all true Florida girls! They like to take their dogs to the beach for some wave action. Richele likes to drive her and her dogs out to Talbot Island. This beach has tons of driftwood, and is really a unique and beautiful place to go. Wherever you go, be sure to check on the rules and regulations of the park regarding leash laws and availability. And always remember to pick up after your pet!